Dominguez is a fun slot in the White Cliffs of the Grand Staircase Escalate National Monument. Slot canyons in the Whites are a rarity (mostly because a lot of the side canyons haven't been explored ). Dominguez offers 3 rappels, highest being 110'. 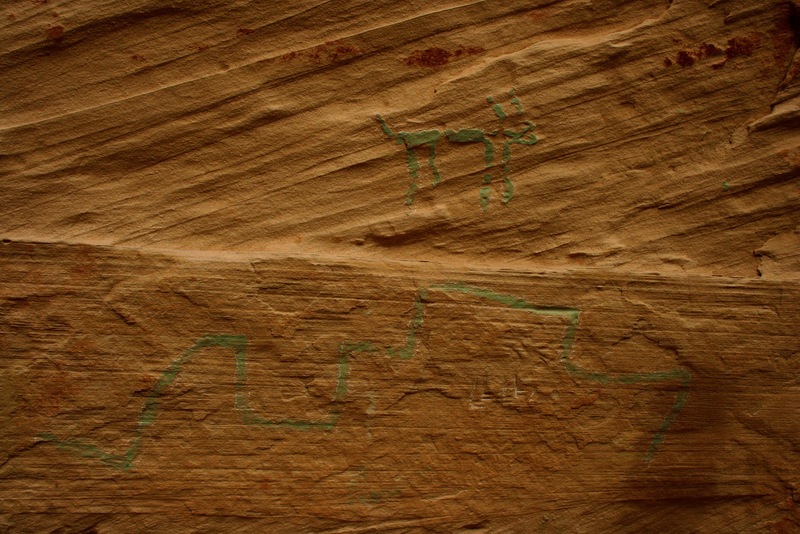 There are some amazing petraglyphs near the canyon as well! From Kanab, UT head east on HWY 89 towards Page, AZ; conversely, from Page, AZ head west on HWY 89 towards Kanab, UT; and turn north on Johnson Canyon RD (UTM 378420 4099874). Drive on Johnson Canyon RD for about 12 miles and turn left onto a dirt road (UTM 377763 4118672), the White Cliffs are really close! Follow the road west and it will drop into the dry creek bed. Stay in the creek bed. The road that pops out the other side might go to something of use, but who knows. The main canyon you are in is called Swapp Canyon on topo maps. Travel on this road for approximately 2.5 miles. Park here (UTM 375639 4120906) at a major fork in the canyon. Hike from this point in the creek bed to the west. You have just entered Dominguez! This part of the hike is relatively easy, under a mile long and only one obstacle to deal with. A short 15' climb that is an easy 4th class at most. At this point (UTM 374748 4121411) the canyon starts to narrow, but look to the left of the canyon and locate a skinny draw that heads up to the top. Pick your way up this draw of rocks and oaks, you'll encounter another climb along the way up. It's similar to the last one mentioned, but a bit shorter. Once up hike around the rim of Dominguez and drop into a drainage, roughly right here (UTM 374566 4121379). It's easiest to then walk down this drainage back to the edge of Dominguez and continue following the rim up canyon. Anchor from a large Ponderosa Pine for this rappel. Webbing and quick link may exist, but it is really easy to use a retrievable anchor here. Just down canyon is rappel numero 2. Anchors were scarce so we built a pile of rocks. Know how to assess and/or build an anchor here. After the rappel is a few down-climbs and stemming through the narrowest sections of the canyon. After the largest of the down-climbs is a large stump wedged in the canyon, here is your anchor for this 110' rappel (It's there you just can't tell it is from under the stump). Follow the canyon back to your car. This is my favorite one from the panel. Hiking group size limits in National Parks and Monuments are usually 12 people. There is no need to place bolts in this canyon so just don't. Just drove out from Cedar City and did this yesterday, great little canyon. The road has been closed at the point where it drops into the wash, so the hike in is more like 2.5 miles now. Rigged a retrievable anchor on the first rap, so it isn't marked but should be pretty apparent. The last rap may have been filled in a bit, to 94' ish. We did it easily with one 200' rope. On the last rap when you initially throw the rope it will look like it is on the ground. It isn't. Be prepared to readjust a bit. The time noted is for the full hike in/canyon/hike out. sorry! That should've been an A on the rating, i fixed it! how much water is in the canyon?